Thank you for your interest in iDrive Small Conveyor Belt. We will be happy to discuss the pricing in more detail with you please fill in your details below and somebody will contcat you back with a quote. Alternatively please call us on 01772 690656 and please reference our part number - iDrive Small Conveyor Belt. The incredible, affordable iDrive compact belt conveyor from Dorner. A compact design with standard features that are non-standard on most other belt conveyors. IDRIVE OVERVIEW iDrive merges new and advanced drive and control technologies for conveyors with the compact design of the Dorner 2200 Series belt model by combining the motor, gearbox and motor controller into a single, space saving package. Dorner has rewritten the book on light duty conveying. Gone are huge motors to do small jobs and in comes clever, efficient design and small conveyor footprints. 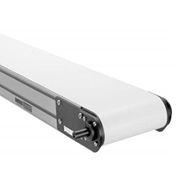 The standard iDrive features cost hundreds of pounds to fit to a standard 240V 3phase motor powered conveyor. The weight capacity is not as high to make a fair comparison, but for smaller products and lighter applications it is ideal. For packaging and industrial applications where machine or working space is tight, or additional room is needed around the area of conveyor it’s the perfect fit. Capable of widths as narrow as 75mm and lengths as long as 3.6M with speeds up to 31M/min, with integrated speed control and forward/reverse/on/off switch it’s unbeatable. We offer an industry leading 10 year warranty on all Dorner conveyors. No other company in the industry offers a longer warranty. Terms and conditions apply. • Internally mounted 24V DC motor and controls save space in tight work spaces. • Low voltage means reduced setup time and no special skills required to set up and wire the total conveyor. • Multiple combinations of pulley and gearmotor sizing for small parts handling • Variable speed and reverse start/stop as standard integrated in to the end housing. (Can be deleted if required) • Control switches simply located on a high impact resistant casing. • Standard 2200 Series 32mm diameter knurled drive roller for assured product transfer. • V-guided belts available for reliable belt tracking. • Maintenance-free brush less 24V DC motor • Incorporates the best features of the 2200 Series. • Rack and pinion belt tensioning for solid, fast and square adjustments. • Dorner’s built-in belt tension indicator for belt stretch monitoring. • Conveyor body has T-Slots for fast mounting of mechanical, safety and automation components.